After Kathy Acker: A Literary Biography – loudlatinlaughing – Euge! Euge! I will read pretty much anything Chris Kraus writes. 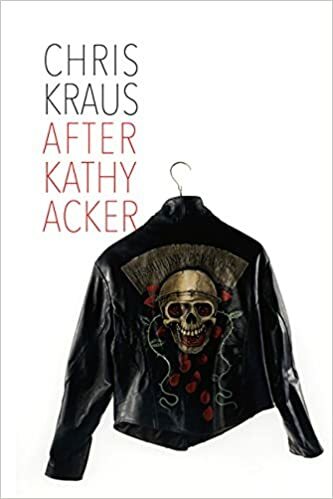 This biography of the irrepressible Kathy Acker fills a huge hole by piecing together fragments from the post-punk plagiarist’s life while casually name-dropping the stars of the 70s/80s art and lit scenes of NY/SF/London. Kraus holds shards of Acker’s writing up to the light, framing them in a way that imbues spectral genius meaning, making it almost approachable. Perhaps I’ll give Acker another try now that I’m equipped with her backstory and guideposts to which of her works are easily consumed. Through no fault of her own, Kraus continues her tradition of making me feel dumb as I realize how much I don’t know, jotting down names of writers and artists and pieces and magazines. Weighted down by my own ignorance, it was a treat to have familiar faces bob out of the mist, like Bernadette Mayer and Pat Highsmith who both crossed paths with KA, either in a big way (Mayer) or tangentially (Highsmith through Lil Picard). The book settles the conflicting opinion of whether Acker was wealthy or not. Yes, then no, then yes again once her grandmother died. With her inheritance, she seemed to purchase apartments in London and NYC at the drop of a hat, but at the end of her life, dying of cancer and refusing chemo, wasting away in Tijuana, she had very little left. One of Acker’s main influences was David Antin, teaching a poetry seminar at UCSD and who, out of fear of having to read too many maudlin undergrad poems, instructed his students to “find someone who’s already written about something better than you could possibly do at this moment in your life, and we’ll consider the work of putting the pieces together like a film.” This layering of “found” text is an integral part of Acker’s work from then on. Acker lived in a couple of locations in the Haight/Cole Valley: 46 Belvedere St. and 929 Clayton St. She also stayed with friends in Noe Valley and traipsed around to various punk/dyke/dive bars in the city. She produced pamphlets at a Noe Valley print shop and bookstore called the Empty Elevator Shaft (1970s). When KA came back to SF in 1990, she fell in love with the welcoming community and found a kindred spirit in Avital Ronell (whose Telephone Book I’ve tried to read but may give Crack Wars a try). A reminder of kinder, gentler times: “Throughout the 1970s, welfare, unemployment insurance, and disability SSI were the de facto grants that funded most of New York’s off-the-grid artistic enterprises.” There was also an abundance of grants. Acker applied for and won a CAPS (Creative Artists Public Service) grant in 1975 to travel to Haiti for research for a book. Bernadette Mayer’s Memory exhibition in 1972; she also edited 0 to 9 magazine between 1967-69.